MAXIMIZE COMFORT AND CONVENIENCE: Hideaway tree strap and Adjustable Padded shoulder strap makes this bag perfect for both blind and timber setups. The MOJO® Timber/Blind Bag was crafted with a durable water resistant material in the Mossy Oak® BLADES camo (orange interior), maximizing comfort and convenience. 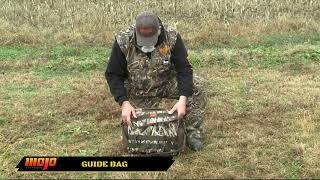 This bag is ideal for carrying all of your hunting gear or accessories, as well as, extra shells or Fatal Shot Custom Choke Tubes. Keep your cell phone or other small electronics safe and dry with a dedicated, waterproof interior pocket. A hideaway tree strap makes this versatile hunting bag perfect for both timber and blind setups.